The String Cheese Incident is thrilled to announce the release of Rhythm of the Road: Volume 2, Live In Las Vegas – the second installment of SCI’s live archival series that highlights the band’s most celebrated concerts with re-mastered limited edition releases. The three-disc set will be released on October 9, 2015 on SCI Fidelity Records. Fans can get a taste of this special release exclusively today on JamBase, who is premiering the track “Got What He Wanted.” Listen HERE. The String Cheese Incident were in the middle of their 2001 coast-to-coast summer tour when they pulled into Las Vegas for the band’s first ever, “Sin City Incidents.” Touring in support of the band’s new studio album “Outside Inside,” and a couple days after the live Austin City Limits TV taping, the band settled into the Aladdin Theatre in July 2001 for two incredible late-night Incidents. Rhythm of the Road: Volume 2, Live In Las Vegas features the best moments of that two night run and includes fan favorites such as “San José” and “Howard,” as well as rare bust-outs like “SKAT” and more. The audio has been completely re-mixed and re-mastered, creating a listening experience that all SCI fans will enjoy. Pre-orders for album are available now through the official SCI online store: http://bit.ly/1VNANEU. Those who pre-order the album will automatically be entered to win one of several prizes – one hundred people will be randomly selected to receive a signed copy Rhythm of the Road: Volume 2, Live In Las Vegas. 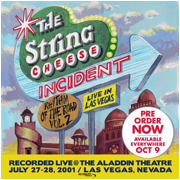 Ten second prize winners will receive free MP3 downloads of every Las Vegas show that is available on LiveCheese.com, five first prize winners will receive the MP3’s as well as the official Aladdin Theatre show poster from 2001 signed by the band. One grand prize winner will win a pair of tickets to all three SCI NYE shows in Colorado as well as the MP3’s and signed poster.